Pure Analyzer Metering is not a full product, in order to run this, the Pure Analyzer Essential is required! The principle of the Pure Analyzer System is to provide the option to capture the source signal with an entry-level laptop, or any other hardware supporting standard VST/AU/RTAS/TDM plug-ins, using the Sample grabber plug-in (see more under "Pure Analyzer Essential"). 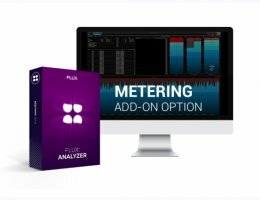 The Pure Analyzer Metering provides an extensive set of measurement tools well adapted for Broadcast and Post Production facilities, presenting the metering tools for a vast range of standards such as True Peak, RMS, ITU-1770, EBU-R128 (PLOUD), history and more. As a complement to the Pure Analyzer Essential, in addition to the Pure Analyzer Metering module, two other different add-on modules providing specific tools for their actual field of usage, are currently available. In order to use any of the add-on modules, the Pure Analyzer Essential is required. Pure Analyzer Essential is required in order to run Pure Analyzer Metering.